New York Mayor Bill de Blasio added his voice to other expressions of concern over the slow EMT response in the midst of a fire last weekend that left two 4-year-old siblings dead, the Associated Press reports. According to the news wire, de Blasio said that it was "unacceptable" that ambulances took longer than 10 minutes to respond to the fatal fire. "I am very, very concerned," de Blasio told reporters at an unplanned press conference on Tuesday. "And if we have to make some changes we'll make some changes, because when we do this work we have to know that each and every time, the ambulance will get there as quickly as humanly possible." Late Saturday night a fire erupted in a Queen's home, reportedly the result of a child playing with fire. Aniya Tinglin and her half-brother, Jai'Launi, did not survive the blaze. According to AP, the first 911 call was made at 11:51 p.m. Saturday, but an ambulance wasn't sent out until 12:05 a.m. Sunday. De Blasio said it was undetermined as to whether a more timely response would have saved the two children. Fire Commissioner Salvatore Cassano is looking into the lack of response. According to the report, ambulances aren't typically dispatched until firefighters can confirm that the call is not a hoax. The first truck, however, did confirm the fire at 11:57 p.m., a minute after arriving on the scene. "[The 911 system] is something we have to monitor all the time. 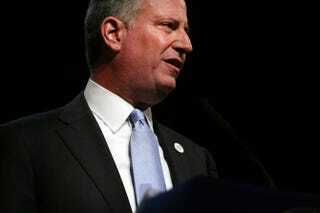 Every day we have to work on response time," de Blasio said at the presser. "We all know something went wrong. We have to know why it went wrong. We have to know how to fix it going forward. It's not acceptable." A video from the scene of the fire showed firefighters enraged that there were no paramedics on site to treat the children they pulled out of the building. When personnel did finally arrive at the scene, they were reportedly in no hurry. "Stop walking and run!" one firefighter reportedly screamed on the video. "Come on, let's go! There's a f—king baby not breathing! Hurry up!"